Hewlett-Packard has been on a “new printer” rampage. They’ve released several new black printers over the past few weeks. Fast and secure is the name of the game for this printer. This energy efficient printer outputs 40 pages per minute. In addition to duplex capability, the M402dn has security features to safeguard your print data. More information can be found at the Pro M402dn product page. The estimated retail price is $299. This multifunctional wireless printer wears a lot of hats. It can print, scan, copy and fax. The device keeps printing safe with LDAP authentication and other security features. The printer’s speed is fast at 40 pages per minute. 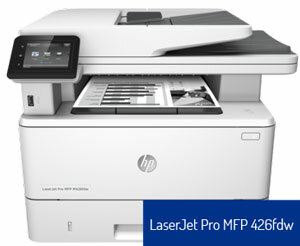 Check out the Pro MFP M426fdw product page for more information. 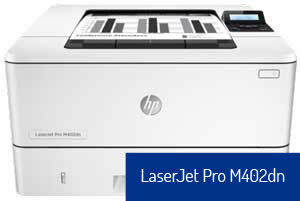 The M426fdn is another printer released in the LaserJet Pro MFP series. It’s similar to the M426fdw except without wireless capabilities. The suggested retail price for both printers is $449. These toner cartridges can be used with any of the new LaserJet Pro printers. We love having you visit our blog for new printer supply announcements which are posted monthly. But there’s a better way to get toner cartridge supply data. TRIguideOnline. It’s an online printer cross reference guide. Powered by the industry’s most accurate data, the guide cross-matches parts and supplies with printers. The data is continually updated so you’ll always have the most current and accurate information, which can be retrieved from any web browser. You’ll never have to spend time chasing toner cartridge numbers again! This entry was posted in HP Toner Cartridge Data on October 8, 2015 by Lena Andersson.